The Echo retails for $179.99, but its price has been cut in half to $89.99 for today, which exactly matches the Prime Day deal. 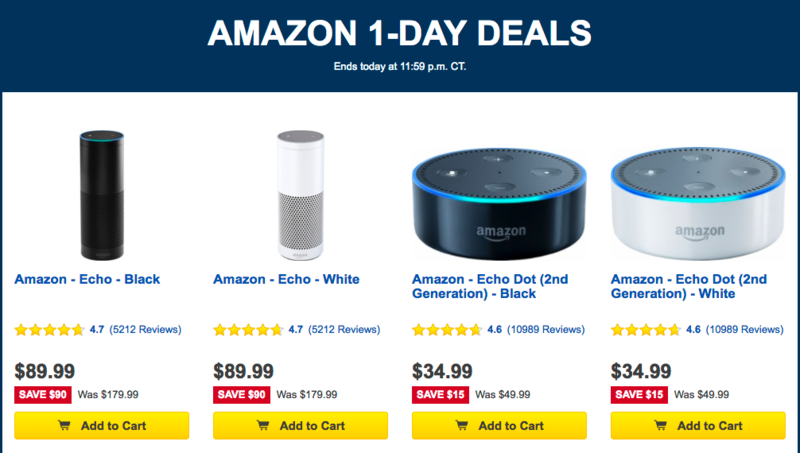 Similarly, the Echo Dot is selling for the Prime Day number of $34.99, which is $15 off its $49.99 MSRP. Both are available in black and white colors. The Amazon Tap wasn't even discounted for Prime Day, but is going for just $79.99, which is $50 off the $129.99 list. Moving onto Amazon's Fire tablets, the 7" Fire 7 with 8GB of storage is just $29.99, $20 off the $49.99 MSRP. The 8" Fire HD 8 with 16GB is $49.99, which is $30 off the $79.99 MSRP. 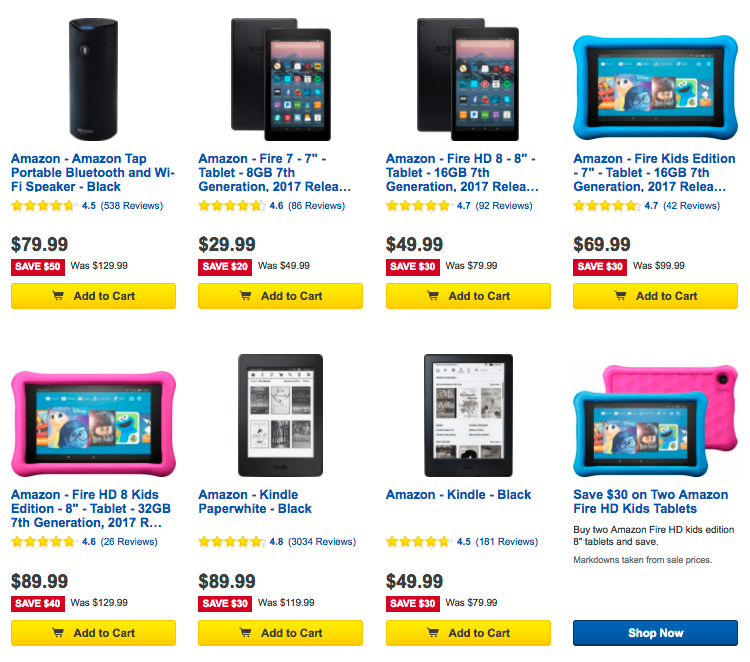 The Kids Edition of the 7" model with 16GB is down to $69.99 ($30 off the $99.99 list), and the HD 8 Kids Edition with 32GB is only $89.99 ($40 off the $129.99 MSRP). These are all 2017 models, so you're getting the most recent specs to boot. You can also save an additional $30 if you buy two of the aforementioned Fire HD 8 Kids Edition tablets. And if you're looking for cases, you can get $5 off select Insignia Folio and Amazon cases for the Fire tabs. Lastly, the Kindle Paperwhite is just $89.99, or $30 off the $119.99 MSRP. If you want a cheaper Kindle, the standard model is only $49.99, $30 off the MSRP of $79.99. The Paperwhite price matches Prime Day's, and the standard Kindle wasn't even discounted then. This sale will end tonight at 11:59pm CT, so don't wait up if you're interested in any of these products. These are probably the lowest prices you'll see for a long time. Hit the source link to see a full list of the discounts.